As soon as Amazon announced its intention to build a second corporate headquarters outside Seattle, elected officials from across the nation predictably responded to its request for proposals’ by tripping over each other in a race to offer massive public subsidies and tax incentives to woo Amazon. Philadelphia’s elected officials from both the Democratic and Republican Parties have behaved no differently. At-Large Republican Councilman David Oh introduced a bill to City Council on Thursday that “reduces the business net income tax to zero” of relocating “mega-businesses” like Amazon that employ over 50,000 workers. Amazon is worth $460 billion, and its CEO Jeff Bezos will soon be the wealthiest man in the world. Bezos’ personal net worth is $84.4 billion dollars. He is one of 8 men who control half of the world’s wealth. Bezos and Amazon have accrued this massive wealth by ruthlessly exploiting workers in the U.S. and abroad, crushing attempts to unionize, using its monopoly power to gobble up real estate and push up land value and housing costs in Seattle, and pushing small business owners out of markets. In any city it expands to, Bezos and Amazon can afford to pay business taxes, income taxes, and property taxes. They can also afford to pay decent wages, and provide healthcare benefits and pensions for all of their workers. 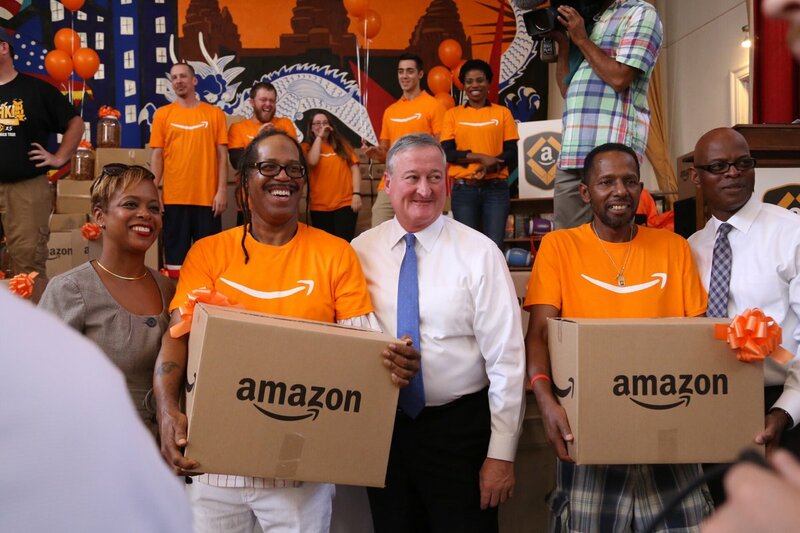 Instead of ‘wooing’ Amazon here with the promise of low wages, subsidies and tax breaks, Philadelphia’s political establishment should be taking the fight for a $15 an hour minimum wage, statewide single payer healthcare, and full funding for our schools to Harrisburg and D.C. As badly as we need to address structural unemployment and poverty in Philly, spending millions of public dollars in exchange for a ‘promise’ to bring thousands of low wage, part time, dead end jobs will only result in increased corporate profits at our expense. We need to stop to the nationwide corporate tax rate race-to-the-bottom. When cities compete against each other to offer corporations like Comcast and Amazon tax incentives, the big losers are our own residents. One third of Philadelphians live in poverty and our schools face enormous budget deficits. SEPTA is unreliable and one of the most expensive public transit system in the country. Public housing is being cut while gentrification and a shortage of affordable housing is pushing us out of our neighborhoods and threatening low-income residents all over the city. Should we really be competing with Chicago, Denver and Baltimore over who can give Amazon the most public money? When establishment politicians like Mayor Kenney and Councilman David Oh offer public money that should be going to schools, housing, and city services to wealthy corporations for private profit, it is clear they stand with corporations and not with working class people. Building Power and Organization Outside the Democratic Party. In Seattle, Socialist Alternative City Council member Kshama Sawant, led the fights that passed a $15 minimum wage and a tax on the wealthy. Sawant and SA are now building a coalition to campaign for affordable housing and supporting the independent Seattle City Council campaign of DSA member John Grant. In Minneapolis, coming off of the recent win for $15 minimum wage, Socialist Alternative member Ginger Jentzen is running for city council as an independent on a platform of tenants rights, affordable housing, taxing the rich to fund city services, and resisting the Trump agenda. In Philly, we are working to build real alternatives to the establishment political machines. We need independent organizations of our own to fight back against corporate hegemony and poverty in our city. We need a political party of the 99% that can run independent candidates for local offices, and not just any candidates but fighting, accountable, independent candidates that take no corporate cash. For a tax on the wealthy to fund public schools, public transit and affordable housing. Previous articlePoland: After ‘Justice Reform’ Protests, Which Way Forward for the Left?